Even though we were hundreds of miles away from any significant landmass, our Drake Passage voyage was never boring. I spent much of my time outside on the bow enjoying the crisp Antarctic air and photographing the wandering albatrosses. Beautiful slender white birds with black and white wings, wandering albatrosses belong to the order Procellariiformes. The descriptive name for birds in this order (which also includes petrels, prions, and shearwaters) is tubenose, and it comes from their ability to drink ocean water and excrete the salt through the tubular nostrils on their upper bills. Wandering albatrosses are impressive creatures with wingspans up to eleven feet—the widest of any bird. Imagine one flying a short distance overhead. On land it might look like a pterodactyl swooping down to carry you off, but on the ocean there’s nothing for size comparison, and you have to remind yourself just how big the bird really is. 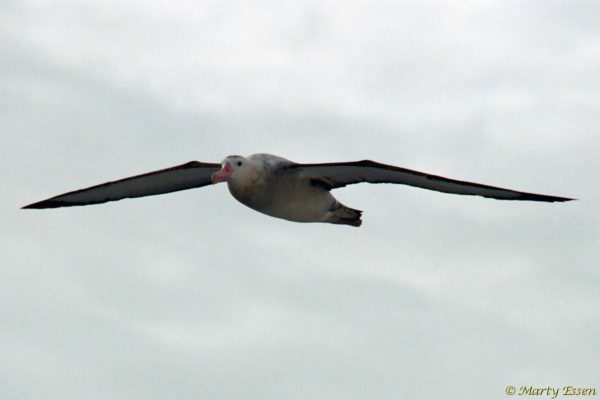 As masters of riding the wind currents, wandering albatrosses seldom need to flap their wings. With just a dip of the head or a subtle tilt of tail feathers, they could adjust their flight to keep even with the ship. Sometimes they’d glide in close, and I’d gaze into their shiny black eyes and feel as if I were flying myself. Wandering albatrosses spend the majority of their lives at sea. When young, they may go five or more years without touching land. When mature, they come ashore on a two-year breeding cycle and lay one egg each time. Sadly, these great birds are a “vulnerable species” (as classified by the IUCN), with fewer than twenty thousand breeding pairs remaining in the world. Their population is declining because their slow reproduction rate can’t compensate for the 10 percent that perish each year trying to scavenge bait from the longlines of commercial fishing boats. Although albatrosses have the entire ocean at their disposal, they seem to prefer the company of ships. Theories for their attraction include curiosity, air currents, and easy access to food churned up in wakes. Whatever the reason, I never would have suspected they were in peril, as one or more were usually gliding nearby.